Motorbike trip is wonderful for those who have good health and like more adventure in their travels. Bike tours to the rugged region offer a more direct experience of the life of its people. It is probably not everyone’s cup of tea, but discovering Vietnam’s rugged and scenic northwest on a motorbike is more than an exhilarating experience. Dramatic landscapes and sweeping panoramas become more direct and intense when the visitor is not enclosed within a vehicle. Watching the rural population doing about its business also becomes a more intimate affair. “We started the itinerary to four mountainous provinces – Hoa Binh, Son La, Dien Bien, Lao Cai – in the northwest region with a 130 km ride to Mai Chau,” said Andre Prince, who took the 7-day journey with six friends from Canada. 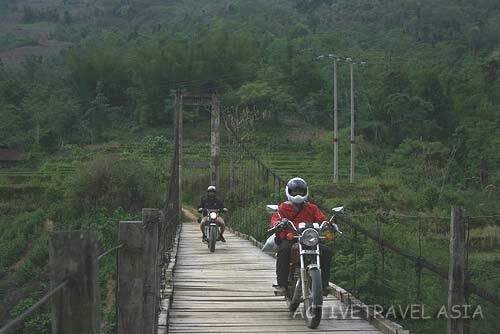 Together with a tour guide, they left Hanoi at 8:30 a.m. and rode the dirt-bikes (175cc and 250cc Yamaha and Honda) west to Mai Chau, home to the Thai ethnic minority. They traveled on road No. 6 passing expansive rice paddies and scenic villages and stopped for refreshment before tackling 70km of undulating roads with great views of mountains and valleys before reaching Mai Chau at noon. “We were really impressed by the traditional stilt-houses, the dances and meals at Pom Coong, a village of the White Thai ethnic minority,” said Andre. The group left for Son La Province the next morning. Kien, the tour guide, said the motorbike trip of about 1,000 km is wonderful for those who have good health and like more adventure in their travels. The tour is also great for finding several vantage spots for photography, he added. Besides the tea plantations in Moc Chau Plateau – the destination of the best green tea in Vietnam that grows along the roads on the hillsides in Son La, the valley of Dien Bien Phu also offers magnificent views. Pass, which means Heaven-Earth. According to local legend, it was the frontier between Heaven and Earth. Pha Din is some 1,000m above sea-level. “Climbing and descending the slopes with their many bends and deep gorges is a really unforgettable experience,” Andre said. The fourth day was scheduled for Lao Cai, where stops at H’mong and Dao villages refreshed the crew after a 225 km ride along stunning gorges and the Nam Na River. Fittingly, Sa Pa was the pinnacle of the trip, where the group stayed for two days and visited several ethnic minority villages deep in the forest. The group also got off their bikes to take a jeep ride downhill to the Muong Hoa Valley, where they trekked on dirt paths through pine forest, terraced fields and H’mong villages. En route they stopped to visit minority schools and had a picnic lunch by the river.